In a hotly contested mayoral race, 55 year old George “Bud” Scholl pulled off a solid victory against his 77 year old opponent, Lewis J. Thaler. 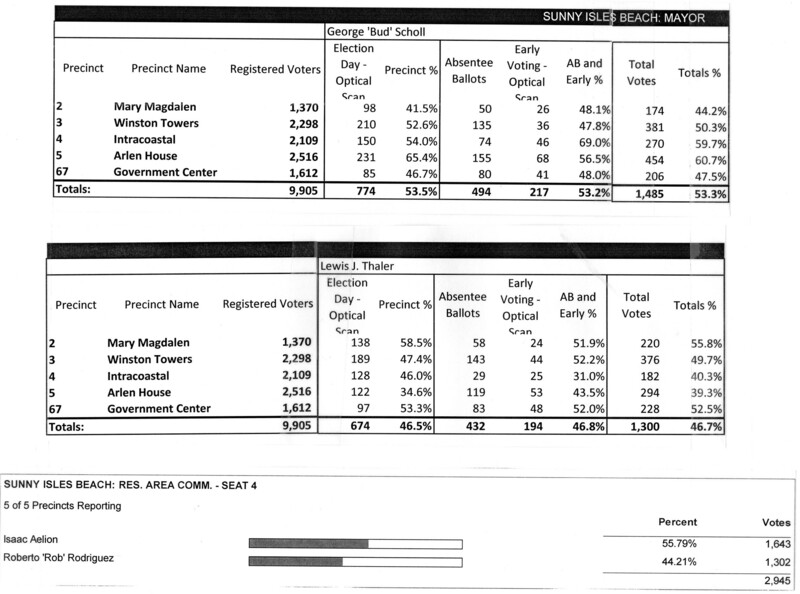 Only 28% percent of registered voters in Sunny Isles Beach turned out to vote. A third candidate who had dropped out of the race still received 10% of the votes cast. Those votes were disqualified. Incumbent Commissioner Isaac Aelion, 63, successfully managed to fend off his challenger, 64 year old Roberto Rodriguez and keep his Commission seat for a second term. We congratulate both our new Mayor-Elect George “Bud” Scholl and Commissioner Isaac Aelion on their wins and wish them the very best as they continue to serve the people of Sunny Isles Beach. Compliments go to The Sunny Isles Beach Reporter. You provided critical information that enabled many voters to see the facts about the candidates and the issues without the propaganda blurring the truth. I’m sure there are many residents of Sunny Isles Beach that have grown tired of the negativity surrounding State and Federal politics. This negativity demeans those who employ it as the prime mover of their campaign strategy. Our young residents who are soon approaching voting age need far better examples of our electoral process and the responsibilities of those who seek public office. The time is now for educators,both in school and in the home, to teach what PUBLIC SERVICE is all about: Not just POLITICS. Our City’s political process needs a rebirth of civility, respect for one another and quite simply, an absence of malice. This would be a refreshing and welcome example for our young soon-to-be voters. I am sure they would embrace the change! Well put, Warren Campbell. I agree that it is the responsibility of adults to set an example for our young children to follow. So, I would like to suggest it start with two individuals who clearly need some education of their own on how to behave in the public arena. First, candidate Lew Thaler who is closely associated with the SIB K-8 school and who publicly denigrated key members of city staff to promote his self-importance. Let’s not also forget that he insulted individuals associated with protecting our blood supply, regardless of whether they were employed by the Florida blood bank or the Red Cross, by referring to them as “bloodsuckers.” Next is Carla Mast, the former Pres. of the PTSA of the K-8 school, who felt compelled to place judgement on Mr. and Mrs. Scholl regarding educational choices they made for their children. In fact, she felt so strongly about it that she actually put it in an open letter supporting Lew Thaler. Apparently Carla Mast does not understand that we live in a free country. I think parents (and educators) of the K-8 school should be wary of having someone who thinks like her associated with the school. Mr. Campbell, it is people like you, Lucille, Mad Mom and all the others who posted here that make us feel our efforts have been worthwhile. All of you took the time to make intelligent contributions to this forum and we appreciated your honest input. Our #1 goal in this election was to deliver the truth to Sunny Isles Beach voters. No distorted or false statements – just the simple facts. The results of this election seem to prove we accomplished that. We are confident our newly-elected Mayor has the leadership qualities, independent spirit and capability to meet all the challenges facing our City. Finally, we share your opinion that Mayor-Elect George “Bud” Scholl will be the finest Mayor that this City has ever seen. The Miami Dade Board of Elections posted the OFFICIAL election results yesterday, officially declaring Bud Scholl the new mayor of Sunny Isles Beach. The official results show Bud beating his opponent by almost 7 percentage points. Now that this has been finalized in the eyes of the county we can say with some confidence that our city will be well taken care of for the next four years. Bud will prove to the residents that he understands their priorities and is a man of action. Congratulations to Bud Scholl, our new mayor! Congratulations to Bud Scholl! I cannot imagine the difficulty of taking on the challenge of a campaign, especially against such low-brow and dirty tactics as employed by the Thaler camp. I am glad the voters got it right and that this is all behind us, but I hope there is a way that Thaler can and will be held accountable for all the violations he committed throughout the process. I commend Mayor-Elect Scholl for conducting an honorable campaign and still coming out on top. That is the kind of example we all need! I witnessed something that astonished me today. At the Veteran’s Day Ceremony in Heritage Park, Comm. Gerry Goodman read off all the names of the Veterans that currently live in Sunny Isles Beach, and after each name everyone in the audience would give a round of applause for the veteran. There was one exception, when Comm. Goodman read “Norman Edelcup, our outgoing mayor who could not be here today, but I wish him well in retirement…”, one could have heard a pin drop. Not a single clap or finger snap, not from the audience, nor from the other veterans, nor from the dignitaries sitting on the platform. Not even Comm. Goodman, he just looked around and moved on to the next name. I guess I am not the only one who is glad to see him go! I attended the Veteran’s Day event and also noticed that no one clapped when Mayor Edelcup’s name was mentioned. Interesting! You know what else I noticed? When Comm. Aelion introduced Bud Scholl as mayor elect everyone clapped (some actually cheered) except for Lew Thaler who sat in his seat on the stage with his hands in his lap. It was very noticeable from us in the audience. What a sore loser!